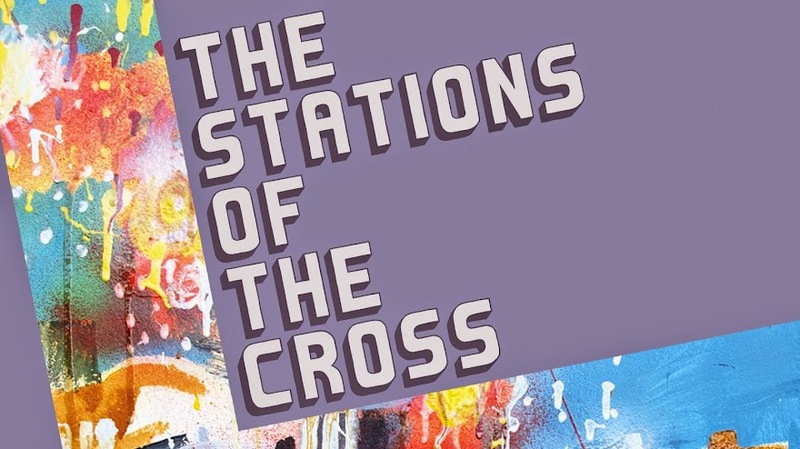 Si: Hi Jo, welcome to the Stations of the Cross exhibition. Can you tell us a bit about yourself and your work? Jo: Hi Si, thanks for having me. I'm a painter and animator. I was born and grew up in Liverpool - I trained in Fine Art in Liverpool and Leeds in the early 1980s. Over the last 30 years I have managed to keep making art by supporting myself in a variety of ways. It's not always been easy - and there have been some dark times - but things are working out okay at the moment. In the nineties, I focussed a lot on animation - which is a very time-consuming, but rewarding, process. My short films were shown at film festivals around the world and won awards. In the last few years I've spent more time painting. There is an audience for my work - I've exhibited a lot and sold paintings. Si: I think that your work has that strong sense of place about it and I love that - even the more fluid, abstract-y pieces feel very grounded in a specific location. Jo: Yes, mark-making is what it's all about. Heheh - dances with brushes, I like that. 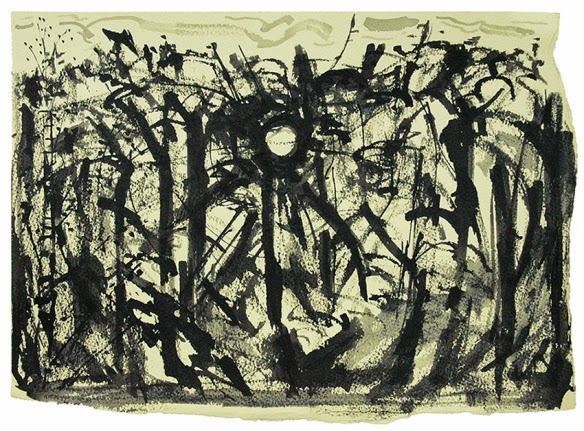 One critic called my work a 'ballet' with paint across a blank piece of paper. But I don't think about it in those terms. 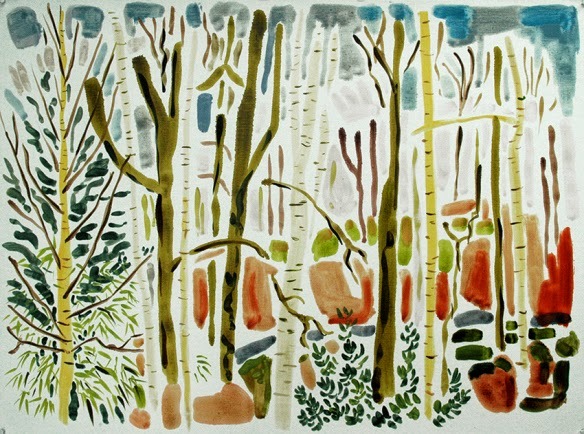 There has always been an element of landscape in my work - well, it is a British tradition in art, isn't it? And you're right, a lot of my abstract work is inspired by landscape - or where I am at the time. I was young when I learned that a landscape can be a metaphor for emotion - or anything, in fact. So I would say that my work is about feeling as well as place. The brush marks or the pencil marks, whatever, they are what create the mood of the piece. Si: I know that you love to get out into the landscape and draw, but I was wondering how much of your work is done out there on the spot and how much is made back in the studio...? Jo: Well, that depends on a few things - the weather, the time of year, the location and so on. And my mood. Yes, I do a lot of drawing outside. I can talk and draw at the same time (usually) but painting is a different matter. The act of painting - to me - is an immersive experience, like talking to your God. I'm not saying that my art is my god - but it is not a trivial thing that I can do with my mind on something else. It's easier for me to paint when I'm alone. And it's hard to be alone outdoors in Leeds 8. 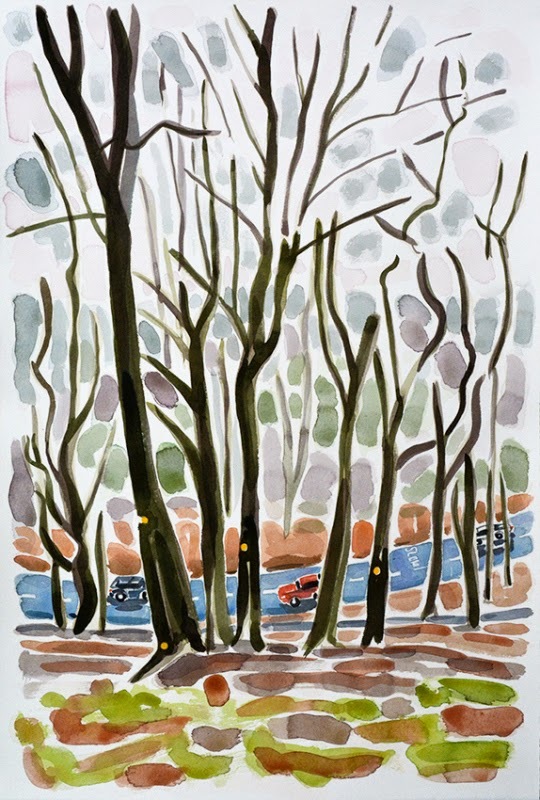 A lot of my recent paintings of Gledhow Valley Woods are painted outdoors - at the moment I'm lucky enough to live next to the woods, so I just have to haul my gear out into the garden. Also sometimes I draw or paint from memory - and that's good, because it goes back to what I was saying about the feeling of a place. Si: I love that idea of making art being like talking with god. I think that the exercise of creativity, art-making, is akin to a sacred ritual in many ways. Certainly the act of creation is a holy one... which leads me to wonder what the role of the artist is. Jo: Talking with god, yes... we all do it in our own way, we just might not describe it like that. Many artists through the ages have worked for god. I feel lucky to be born in the twentieth century - for one thing I didn't have to spend my life decorating a page of holy scripture - I can paint what I choose. As for our role, I think artists have to find their roles in society - and it's not easy. My role has always been there - but there were times I couldn't see it. Other people have helped me find the place I should be with my work. There's a lot of distraction. I am fortunate that I can sell my images - to an extent the commercial aspect reinforces the so-called 'calling' to be an artist. But you have to make sure it doesn't take over - I wouldn't feel like an artist if I had to make concessions to money all the time. "Our grateful thanks go to Roundhay Councillors for contributing to the costs of this Exhibition".